Grab bags gift exchanges are a fun--and sometimes competitive--way to give gifts for holidays like Christmas or Hanukkah. 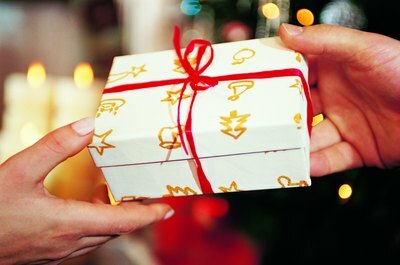 A gift exchange also limits the number of gifts a person must bring to a party or event, alleviating financial stress and letting everyone enjoy the spirit of the game. However your gift exchange occurs, consider these ideas for gifts. For young children, board books, coloring books or games like checkers and jacks make excellent gifts. Make sure that any gifts with potential choking hazards, such as dolls or action figures with small pieces, are given to older children. Ask the host or hostess if you should bring a gift considered "unisex" or one for a girl or boy. Whether you opt for a traditionally gender-specific toy like dress-up clothes or a truck or you choose something universal like books, art supplies or board games, make sure you are aware of the ages of the children who will be attending before purchasing a gift. Adult gifts can range from gift certificates to bottles of wine or spirits. Be conscientious of guests' food restrictions or religious tenets before selecting a gift of alcohol or allergen-prone foods such as nuts. Money clips and tie pins can be a good gift for men at the party, although you should be aware of the spending limit on gifts before considering a piece such as this. If you know the male guests well and are familiar with their favorite colognes, you can also select a gift box of cologne for the exchange. Starting in late November, many perfumes and colognes are available boxed with after shave, deodorant, lotion or body wash. These gift sets are often reasonably priced and sometimes are boxed so as not to need gift wrap. 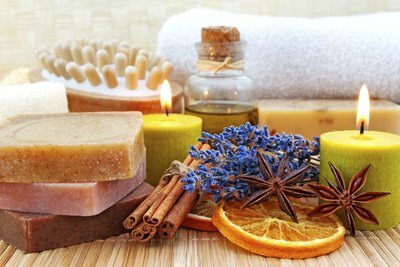 Bath goodies, candles and perfumes remain perennial favorites for gift exchanges, particularly baskets that combine several items such as lotions and body washes. Relaxation masks and plush robes are also versatile gifts for a grab bag exchange. As with men's cologne, boxed gift sets are easy to find as the holiday season approaches and are available for a range of price points. Costume jewelry sets in a holiday motif or theme relevant to the theme of the party (such as a cross necklace at a church Christmas party or a Star of David pendant for a Hanukkah party) are relatively inexpensive and universal--one size fits all. Likewise, home goods like vases, candelabra and coffee mugs or wine glasses are a consideration, as are wine or spirits. Be aware of any religious or allergy restrictions of your guests before bringing alcohol to the party. Passes to a local movie theater, museum, aquarium or zoo are a fun and easy gift that can be appreciated by anyone and are not age- or gender-specific. Gift cards are a classic and popular grab bag gift and can be as simple as a prepaid debit card or a card to a specific store. Board games and card games are versatile gifts for any age and are so widely varied that there is almost certainly something for everyone. From movie-themed variations of Monopoly to word games like Taboo and Scattergories, board games are inexpensive and universal. DVDs of classic movies, cult favorites or new releases are often crowd-pleasers. Be aware of the ages of attendees when selecting movies, and avoid inappropriate or offensive content.